The new web site provides easy navigation, better customer interaction and direct access to Super Seal’s complete line of heat shrinkable products. Stratford, CT November 27, 2012 - Super Seal Corporation has announced the launch of its new website at http://www.supersealcorp.com. The dramatically redesigned site, created by the in-house digital team, embodies Super Seal’s forward thinking and commitment to the growing needs of its customers. The new website, which went live today, offers a number of improvements over then old website providing a more intuitive and streamlined design, with a focus on customer interaction and product specifics. 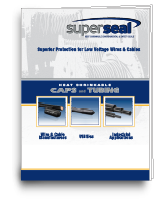 The new Super Seal website provides a wealth of information about Super Seal’s heat shrinkable products for the wire and cable industries, which include the company’s main product lines including End Seal Caps, Low Voltage Tubing and Repair Wrap Sleeves. The website also features a new download center making it easier for customers to access current product literature, product specification data and cross-reference guides. "The new website is just the beginning of the company’s concerted effort to improve communication and interaction with our customers", said Super Seal’s North American Sales Manger Dean Aliberti.